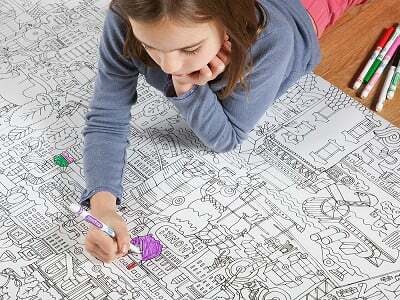 Pirasta coloring posters are detailed wall coverings that your child—or a whole group—will be extra excited to fill in. At almost two square yards, these posters transform your wall or floor into a ginormous coloring book. They’re full of fun, detailed drawings that give kids a lot of interesting places to explore and color. Pirasta was founded by Mira Trezza, whose son used to love drawing (directly) on the wall of her New York City apartment. So Mira did what her parents used to do—cover the wall with a big piece of paper. One day she drew him an entire scene to color in, and that’s when inspiration struck. With sweeping scenes of themes like geography and animals, there’s enough detail in each poster to keep any artist busy. This includes adults . . . these enormous posters are a fun and unexpected group activity for a party or a housewarming. Each Pirasta poster is printed with vegetable ink on recycled paper, and they’re all Made in the USA. Hello everyone! I'm proud to introduce Pirasta to The Grommet. I'd be happy to answer any questions you have! These posters give the appearance of a giant mural, was Mira, the Maker, just sick of kids drawing on her walls so she had to create this? Ha ha! That’s exactly right! When Mira's son started drawing on the walls of her small NYC apartment, it seemed like a good idea to give him a way to pursue his heart’s desire without causing lasting damage. So, she taped a large sheet of paper on the wall, and because he was crazy about rocket ships, she drew him a space scene to color. That was when the idea for Pirasta was born. Pirasta is her son’s made up word for “blast off”. Mira has always loved coloring. When she was young, her parents did the same for her and her sister that she did for her son. They also taped a large sheet of paper to the wall and allowed them to draw and color for hours. When she found her son coloring on the walls of her apartment, it brought back memories and sparked an idea to recreate that same concept with a more sophisticated overlay to appeal to children and adults. Our designs are inspired by the work of the many artists around us. We work with different illustrators to convey their point of view and tell a story with a different vantage point through their artwork, but we stay true to what our brand is about: merging fun, education, art and design. Why are these something kids or even creative people of all ages should have? Pirasta encourages children and adults to think creatively and collaboratively, to learn and foster a love of art. Created by award-winning illustrators, these unique coloring posters and sheets provide hours of endless fun with a result that is worthy of being framed and hung on the wall. We create engaging and complex illustrations that will provide hours of activity and coloring fun -- a creative way to embrace family time and collaboration in a world filled with electronics and isolation. While we tend to associate coloring with kids, we’ve found that adults enjoy it as much as children. In a world overrun by smartphones, tablets and computers, we’re finding that adults are looking for ways to break away from the pressure of being plugged in 24/7, and coloring is filling that need. The Grommet is personal favorite website of ours – we are excited to be a part of The Grommet community to not only connect with main street vendors, but build relationships with individuals and foster a community who values the work we do. We hope our product encourages creators of all ages to imagine their world in a brighter way. We hope creative kids will be inspired to enter our upcoming drawing contest as well. These are a great idea! I'd love to see one in all geometric designs. Also, they don't HAVE to be rectangular either, it would be cool to see one in a large octagon shape, circle, etc. However, I especially like the idea of various geometric designs. This seems like a very cool product and a very good idea. Best of success to Mira! I think I'll share a link to this on my Facebook page tonight...I've got a few moms on my page who would love these. Thank you for the kind words about our products and the support! We love your idea about the geometric shapes! This looks pretty cool! What # weight is the paper (80# text, etc) I am trying to figure out if this is heavy enough paper to hold up to multiple "un-rollings". Thanks. @Kate I love the idea of a space theme or dinosaur theme poster! My grandsons would LOVE it! They love coloring at ages 6 and 10! Thank you of your question! The paper is 100# lb and yes, it is very durable and will last you many un-rollings. What sort of coloring implements do you suggest? Does the paper hold up to water based pens? Terrific idea...thank you! Our posters take watercolor, as well as all types of markers, pencils, pens, gel pens and crayons very well. We love using all of them. Thank you for your question! what are the actual dimensions of these posters? Can you tell me about the quality of the paper please. The dimensions of the poster are 63"x36". The paper is 100 lb, very durable and takes all sorts of pencils, crayons, markers, pens, and gel pens. Thank you, we love your idea! We have a few new products in the works, keep an eye on our website for updates! Right now we only do wholesale custom orders, but we hope to work collaboratively with our fan base in the future. Are the poster on cardboard or paper? The posters are printed on durable 100 lb paper. Thank you for your question! What are the dimensions when folded for mailing? @R D The dimensions are 38" x 4" x 4" for shipping. They are mailed rolled up in a tube. Love the idea. Would like to see some different options for different kinds of kids. Maybe a fantasy scene? An adventure scene? Pirates? Outer space? The ones you have just don't hit home for any of my kids, nieces or nephews. We love getting feedback from our customers! We have some new designs in the works, stay tuned! The poster does not come with any coloring supplies. We encourage creativity on what types of coloring materials you want to use. They're a little "pricey" buy definitely cheaper than repainting the walls, lol. I have 4 kids so one for each adds up. But, so cut I've got to get at least 1. @Linda The posters are 5.25 feet by 3 feet and made of 100lb paper, which is like a thicker card stock. They may appear a little pricy at first glance, however the Pirasta Coloring Posters are going to provide many days of entertainment and will keep your walls much safer! The size (63"x36") of the poster invites a lot of people to work together at the same time. The illustrations are engaging and complex and the posters embrace family time and collaboration. One poster can provide 40-50 hours of coloring fun! What are the dimensions of the poster? I am a nanny who is always looking for something creative that can be toted from home to home. Is this fully portable? The posters come rolled in a lightweight sturdy box that is easy to carry. I'm trying to encourage my charges to avoid violence and to respect food. What does the Food Fight poster actually depict? @Lee You can view a higher quality image of the Food Fight poster here. Great question! Our Food Fight poster is a conversation starter about food. It encourages children and adults to discuss healthy eating habits by engaging children in a fun interactive way. The characters in the illustration are competing to get to the top of the Food Pyramid and the illustration is playful and non-violent. Thank you for sending this! We love your idea! @Sophie Can you give an age range? @Sophie Good thing! I'm 65 and fit right in. These are marvelous. I love to color, either by myself or with my 9 year old granddaughter. These look like so much fun. They are especially appealing to someone who enjoys putting together puzzles; the way each element leads to the next looks like mega fun. Thank you for coming up with this wonderful idea. Yes, Diane, they are just like a puzzle! I was thinking the same thing. Thanks so much for the kind words. I hope you and your granddaughter enjoy! I am a second grade teacher in Madison, WI, and I would love to see posters around the insect life cycle, air and weather, solids and liquids, and urban, suburban and rural communities. Thanks! Hi Barbara, those are all great suggestions! I'm sure Sophie and co. will keep those in mind going forward. Go Badgers! 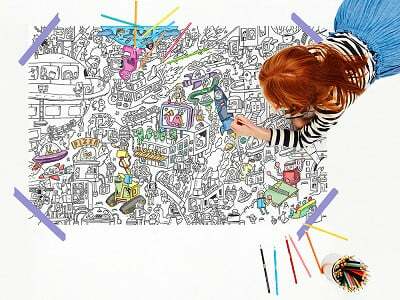 Pirasta coloring posters are detailed wall coverings that your child—or a whole group—will be extra excited to fill in. At almost two square yards, these posters transform your wall or floor into a ginormous coloring book. They’re full of fun, detailed drawings that give kids a lot of interesting places to explore and color. Pirasta was founded by Mira Trezza, whose son used to love drawing (directly) on the wall of her New York City apartment. So Mira did what her parents used to do—cover the wall with a big piece of paper. One day she drew him an entire scene to color in, and that’s when inspiration struck.